Kawasaki W800 Retro On Its Way? 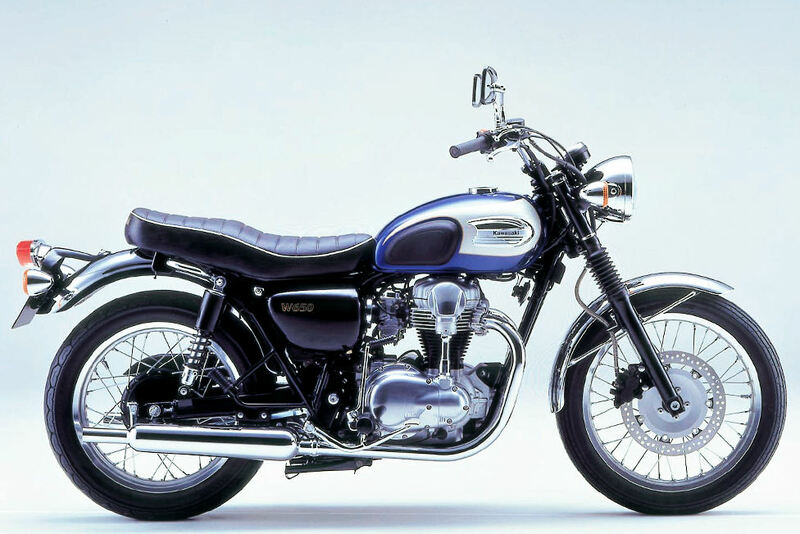 This is a picture of the Kawasaki W650 that was available for sale in the United States for just a couple of years (I believe 2000 and 2001). It was available in other markets until 2008, and was generally well-received by both the press and enthusiasts who bought one. It is rumored that Kawasaki is about to debut a successor displacing approximately 800cc and known as the W800. The original W650 had a 360 degree crank, operative kick starter and other retro influences intended to mimic a British twin of the 1970s. The W800 is expected to have more power (coming from the larger displacement), fuel injection (replacing the carbs on the old model), and possibly a disc rear brake (the W650 had a drum in back). If the W800 does appear this year, it will probably be shown first this fall at Cologne, and we have no idea whether it will be made available in the U.S. market. If you own an old W650, post a comment with your impressions of the bike. I keep hearing comparisons with the new Bonnevilles and (having owned both a “W” and a Hinkley Bonneville) I feel obliged to comment. I love air-cooled twins which make adequate power in an unstressed fashion in a bike with a “normal” steering geometry and riding position. I like quality bits and a lack of plastic. I like to get a good mpg – something motorcyclists used to brag about but no longer. That is the reason I bought both bikes. My decision had nothing to do with brand allegiance or whether the bike would fit my image. My vote has landed firmly with the “W” (which I still own). The long stroke engine is torquey and characterful. Its is mechanically quiet and has no cam chain (this is a great advantage for anyone who likes to wear their bikes out). It acheives a full 20+ (British) mpg’s more than the Bonneville. It is easier to work on – for instance, valve clearance adjustment on a Bonneville is a cam-out job. Standard equipment spec is much better. Finish is better. It’s lighter and more nimble, which suits my riding preference for staying away from highways. The “W” has it’s faults, but love is blind, and I really struggle to recognise them. I will be tempted by the new 800 but probably would’nt buy one. Less is more for me. I think the main issues for me will be size, weight and complexity. I have a ’00 that I bought new. Me and hundreds on the very active boards have since twiddled and tweaked our bikes to squeeze out whatever extra power we could but in all truth, it has power enough. In fact, it’s a great bike because it’s so well balanced right out of the box. I think as opposed to displacement and complexity, we buy this type of motorcycle because we want simplicity and lightness. Just check out the W650 customs that Deus Ex Machina are building down under and you’ll see what I mean. Good points, Michael Y. I imagine the new W800 won’t be much heavier, and any complexity it will have will come from the fuel injection. The new larger displacement should put it at the same power level of a tweaked and hot rodded 650. So hopefully, the 800 will be just as well balanced a motorcycle as the 650. If it’s half as good as the Bonnie it will be a hit ! But then I thought the Drifter 1500 was a hit ???? i’ve owned a 2000 w650, and two triumph bonnevilles. if kawasaki builds the w800 i’ll buy it too. very sweet, beautiful bike. i hope it comes to the us. i also think triumph should build a bigger bonnie with the t-bird engine. the t-bird is getting a lot of good press but i hate the harley styling. btw, i love kawasakis zrx1200 (lawson replica) too. another one of the best bikes i’ve ever owned and wish i didn’t sell. i hope kawasaki builds both again. i’ll make room in the garage. i love reliving the bikes and memories of my youth!